Objective Investigators within many disciplines are using measures of well-being, but it is not always clear what they are measuring, or which instruments may best meet their objectives. The aims of this review were to: systematically identify well-being instruments, explore the variety of well-being dimensions within instruments and describe how the production of instruments has developed over time. Design Systematic searches, thematic analysis and narrative synthesis were undertaken. Data sources MEDLINE, EMBASE, EconLit, PsycINFO, Cochrane Library and CINAHL from 1993 to 2014 complemented by web searches and expert consultations through 2015. Eligibility criteria Instruments were selected for review if they were designed for adults (≥18 years old), generic (ie, non-disease or context specific) and available in an English version. Results A total of 99 measures of well-being were included, and 196 dimensions of well-being were identified within them. Dimensions clustered around 6 key thematic domains: mental well-being, social well-being, physical well-being, spiritual well-being, activities and functioning, and personal circumstances. Authors were rarely explicit about how existing theories had influenced the design of their tools; however, the 2 most referenced theories were Diener's model of subjective well-being and the WHO definition of health. The period between 1990 and 1999 produced the greatest number of newly developed well-being instruments (n=27). An illustration of the dimensions identified and the instruments that measure them is provided within a thematic framework of well-being. Conclusions This review provides researchers with an organised toolkit of instruments, dimensions and an accompanying glossary. The striking variability between instruments supports the need to pay close attention to what is being assessed under the umbrella of ‘well-being’ measurement. 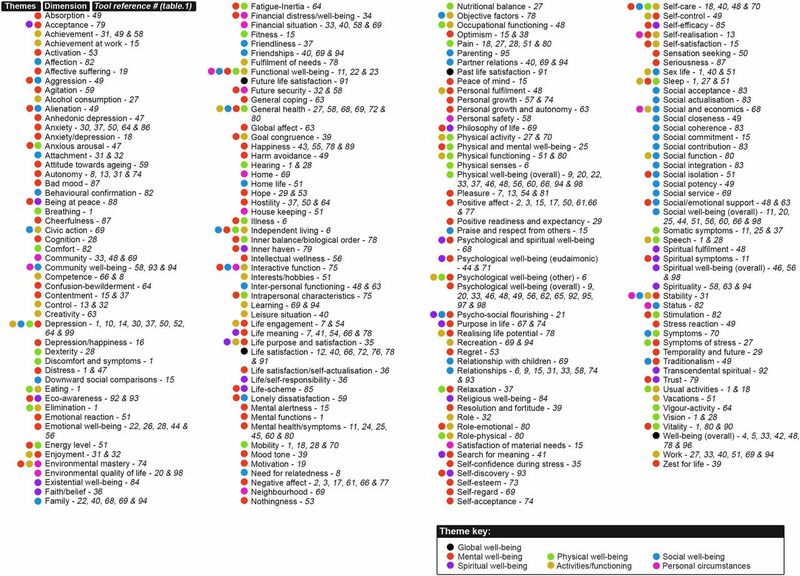 Compared with the largest review of the topic to date, the current review contains an additional 40 instruments, and provides an organised index of dimensions not found elsewhere in the literature. This review provides the first quantified demonstration of how self-reported measures of well-being have developed over the past 50 years. The aim of the review was limited to adult generic measures due to practical constraints, and as a result condition-specific instruments and tools designed for use with children and adolescents were not included. The importance of well-being has been widely acknowledged in the past 20 years. Increasing interdisciplinary work on the topic,1 explicit governmental interest in measuring subjective well-being (SWB),2 ,3 and public interest4 are evidence of this. Simultaneously, the measurement of well-being, broadly defined as ‘the quality and state of a person's life’,5 has become an area of growing prominence for academics, healthcare professionals and policymakers alike.6 ,7 However, despite extensive study on the topic,8 there is little available consensus in the literature on the range, contents and differences between self-report measures of well-being. Fundamental to the challenge of measuring well-being is the extent of disagreement over its definition9 and theoretical basis.8 For example, definitions of well-being often differ by discipline, and are frequently confused with related topics such as health-related quality of life, happiness and wellness. Theories of well-being are problematic due to their vast numbers; for example, some investigators approach the topic from the perspective of basic human needs,10 while others examine the capabilities of individuals11 and multiple theories have been integrated into new hybrid approaches.12 However, relatively little attention has been paid to how these varying perspectives have influenced the development and range of well-being measurement instruments in existence. Ambiguity is also caused by variability in the dimensions of well-being used between instruments. Here, dimensions are defined as the underlying aspects of well-being that authors are trying to measure, such as self-acceptance, life satisfaction or social integration.17–20 The presence of differing perspectives on the topic21 is one likely cause of this ambiguity. Although the biological, psychological, social, economic and spiritual dimensions of well-being have been acknowledged in the literature,22–24 the way in which they are operationalised as dimensions across measures of well-being is largely unstated. Thus, researchers are provided with little guidance on how and where dimensions of interest can be found within the growing number of measurement instruments available. As with most domains of measurement, there is no agency or group that oversees and coordinates the development and organisation of well-being measures. Instruments are scattered across disciplines, inconsistently labelled, and the differences between them are unclear.18 Despite efforts by the Organisation for Economic Co-operation and Development (OECD) to formalise the measurement of well-being,25 not enough exhaustive advice is provided on how researchers can effectively use the many self-report instruments that have already been developed within existing literature. Researchers aiming to measure well-being are left to select instruments based on what is familiar to them within their particular discipline, what is most often used by others or to create yet another new instrument. Despite these issues, well-being remains a highly prioritised concept of interest. Beyond being a valuable outcome in itself,26 the explicit measurement and improvement of subjective forms of well-being has become a key policy and government objective.27 ,28 This is in part due to the observation that being healthy does not guarantee a person feelings of well-being,4 and the finding that ‘objective’ indicators of well-being such as income can only give a partial account of what it means to live well.2 As such, interest in self-reported forms of well-being seems both practically and empirically sensible. Previous reviews have highlighted some of the available tools.29–31 However, not all have used systematic methods for identifying measures. Many of the reviews to date have focused on psychometric properties such as validity and reliability; however, the tools themselves are typically listed without clear analysis of how their content differs. Further, the evolution of instruments over time and their theoretical underpinnings have not been described. These issues justify this review, which aims to inform researchers and practitioners about the breadth, variety and content of available measures of well-being. The aims of the current review were to: (1) identify measures of well-being; (2) describe the characteristics of the identified instruments; (3) describe and depict how the measurement of well-being has developed over time and (4) organise the dimensions identified into a conceptual framework, highlighting key themes of well-being, and the instruments that measure them. Dimensions were defined as the conceptual subscales that the instruments investigated covered. Themes described the overarching conceptual domains that the dimensions reflect, or fit into. Our wider objective was to provide researchers with a framework and glossary of terms to aid in the selection of well-being instruments containing the most appropriate dimensions for their purposes. Searches were conducted in MEDLINE, EMBASE, EconLit, PsycINFO, Cochrane Library and CINAHL databases (see online supplementary appendix 1). ‘Systematic’ within the context of the current review refers to the fact that a specific and structured search strategy was used. Additional manual hand and web searching was undertaken through 2015 using online resources, search engines and consultations with subject matter experts. The systematic search was limited to records as far back as 1993 in order to ensure we were focusing on old and new instruments that were being used in the past 20 years. Well-being measures were identified by searching through identified publications. Instruments were included in the review if they were: (1) designed for general use, either in population studies or as generic tools across contexts; (2) designed for use in adults; (3) designed for assessing well-being, including concepts such as quality of life, happiness and wellness and (4) available in an English translation. Instruments were excluded if their primary focus was: (1) disease specific (ie, cancer or stroke-specific tools); (2) context specific (ie, pregnancy) and (3) instruments designed for children or adolescents. Data extraction was undertaken by two reviewers (M-JL and AM-L). Details extracted included the name of the instrument, its acronym, authorship, date of publication, number of items and response format, theories referenced, date of initial development, and the date of the latest available version of the instrument. Details about the dimensions within each instrument as specified by the author were recorded using a similar form. The dimensions extracted from identified instruments were organised using thematic analysis32 in order to categorise them into themes. The qualitative analysis was undertaken using NVivo V.8 (NVivo qualitative data analysis software, Version 8 [program]: QSR International Pty Ltd Australia, 2008). First, the dimensions and definitions were tabulated. Prior to the analysis, the review team (M-JL, AM-L and PD) examined the full set of dimensions and combined dimensions that were unanimously identified as being indistinguishable. After a process of familiarisation with the data, each dimension was qualitatively coded. For example, dimensions such as hearing and vision clustered around the code ‘physical senses’. Coding was undertaken by two reviewers (M-JL and AM-L) and any discrepancies that arose were solved through discussion with the third member of the review team (PD). These clusters of coded dimensions were gradually assembled into larger groupings that formed preliminary themes. Once these key themes were reviewed and amended by the review team, they were defined and named. It was anticipated that themes might overlap and that dimensions could fit within multiple themes; however, the categories provided by the technique afforded some order to the otherwise unmanageably large range of dimensions. The review team included academics with backgrounds in psychology (M-JL), economics (AM-L) and clinical medicine/public health (PD), helping to minimise disciplinary biases. Results were synthesised as a narrative review. The PRISMA33 diagram summarises the search results, screening and exclusion of studies (figure 1). The systematic search provided 2520 unique records after duplicates had been removed. 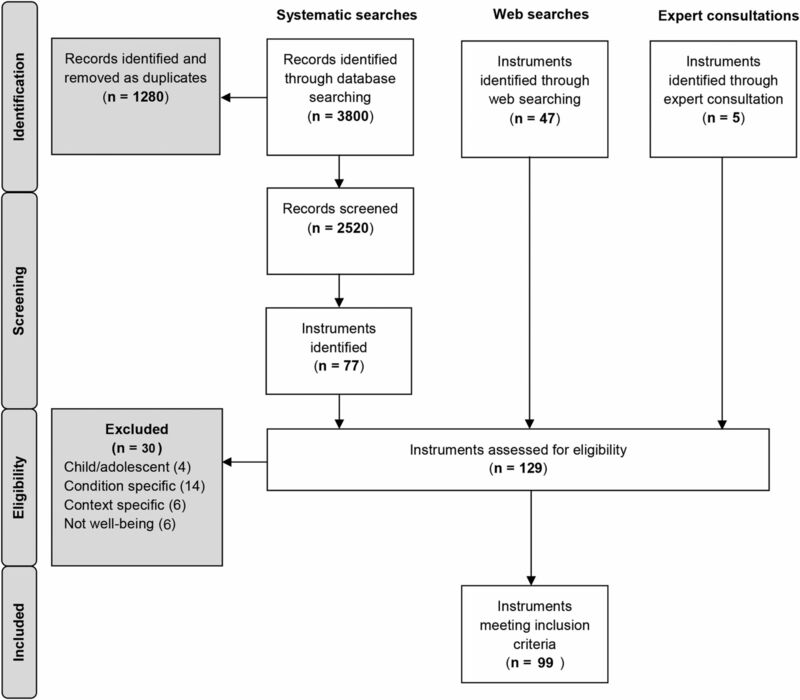 From the identified publications, a total of 129 instruments were assessed for eligibility, and 30 of these instruments were excluded as they were either: designed for use in children/adolescents (4/30); explicitly designed for use in specific clinical conditions (14/30); designed for specific contexts (6/30) or were deemed by the review team to not be measures of well-being (6/30). Table 1 contains details on each of the 99 instruments included in the final review. Many of the instruments have been amended and shortened from their original format; therefore, the instruments included in table 1 are either: (1) the original tools if no revised version was found or (2) the latest revised version. A breakdown of when the instruments were first developed and their most recent major revisions can be found in figure 2. Developmental timeline of well-being measures. The majority of measures contained multiple items (95/99), the largest containing 317 items (tool 78: SEQOL). Most of the instruments used verbal questions (97/99), however two tools were pictorial (tool 12: CL and tool 96: WPS). The fewest response options were found within simple yes/no questionnaires (tool 37: KSQ), while other tools offered up to 11 response options along a bipolar scale (tool 26: HM and tool 58: PWI-A). However, the majority of the tools used five-point bipolar Likert scales. Items asked individuals about the frequency; intensity; strength of agreement; or truth of specific and non-specific thoughts, feelings, experiences and statements. Instruments were named after key authors (11/99) such as the Rosenberg Self-Esteem Scale, academic affiliation (7/99) as with the Oxford Happiness Questionnaire or organisational affiliation (5/99) as with the WHO-5. In the majority of cases, instruments were named after their key concept or approach. The two theoretical influences most commonly reported in the literature were Diener's127 model of SWB and the WHO definition of health: “a complete state of physical, mental and social well-being”.128 Maslow's10 hierarchy of needs; Sen's11 capability approach; Antonovsky's129 theory of salutogenesis; Ryff's130 psychological well-being; Fisher et al's131 spiritual well-being model and self-determination theory132 were also referred to. In many cases, however, authors did not specify the theories that had influenced the design of their instrument. Most instruments were developed by interdisciplinary teams. However, classifying instruments by discipline proved impractical. Clinical psychology, medical sociology, public health, epidemiology, psychotherapy, health psychology, nursing, gerontology and primary care were among the disciplines represented. In some cases, such as the Warwick-Edinburgh Mental Well-being Scale (tool 96), multidisciplinary input spanned colleagues from medical schools, faculties of health and social care and schools of sociology and social policy. Although the systematic searches were limited to 1993 and 2014, almost half of the instruments we identified during this time had been first developed in the decades prior to this period (44/99). As shown in figure 2, the oldest instruments identified were developed in 1961 (tool 39: LSI-A and tool 10 V.1: BDI) while the newest tools were developed in 2015 (tool 33: ICOPPE and tool 23: FWBS). 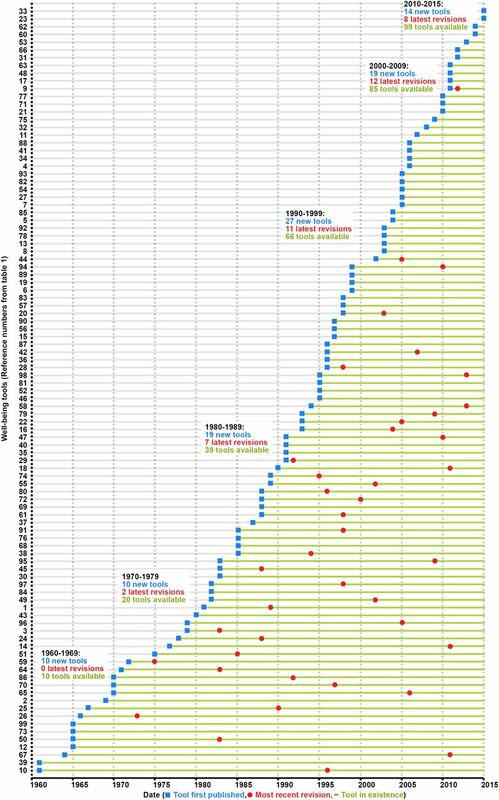 On average, eight tools had been designed every 5 years since 1960. The 1990s provided the biggest period for the development of new tools (n=27). Since 2010, 14 new tools and 8 revisions have already been published. Three trends were observed over time. First, many newer measures contain fewer items, or are accompanied by short-form versions. Second, since the 1980s, with measures such as the Spiritual Well-being Scale (tool 84), spirituality has been incorporated into the assessment of well-being. Finally, over the past 15 years, there have been significant efforts to contrast the many measures of ill health and unhappiness with measures of positive functioning and adaptation to negative circumstances. Examples of these instruments included the Salutogenic Health Indicator Scale (tool 75), Positive Functioning Inventory (tool 62) and the Flourishing Scale (Tool 21). The subjective component of well-being was consistently divided into an ‘affective’ component concerned with emotions and a ‘cognitive’ component concerned with how people evaluate their own lives.50 ,109 The difference between SWB and terms used synonymously seemed to be unclear. SWB was noted as a synonym of happiness,116 mental well-being and mental health were acknowledged as being used interchangeably throughout the literature,133 and psychological well-being was used as an alternative phrasing for mental health.74 Authors were generally inconsistent on whether happiness should be understood as synonymous with SWB, specifically the affective portion of SWB, or a separate concept in itself. As the instruments were attempting to measure well-being through self-reported means, little explanation was given regarding how objective well-being should be conceptualised. The explicit difference between definitions of well-being and health appeared paradoxical. Authors frequently quoted the WHO definition of health as ‘a state of complete physical, mental and social well-being, not merely the absence of a disease’.93 ,104 This understanding blurs the boundaries between health and well-being. As such, many measures of well-being resemble multidimensional measures of health. Across the 99 instruments identified, 196 different dimensions were found. In the 10 tools identified (period 1960–1965), 18 of the 196 dimensions were identified. Of these, the most common dimension was ‘depression’ (found within 3/10 tools). In contrast, more favourable dimensions such as ‘positive affect’ (found within 8 tools) have gradually appeared within instruments over time, and reflect a conceptual rebalancing in the topic. Psychological well-being overall (n=13); physical well-being overall (n=12); social well-being overall (n=9); depression (n=9); positive affect (n=8) and relationships (n=8) appeared multiple times within the instruments examined. The majority of instruments were multidimensional (67/99), and on average contained 5 dimensions (range 1–15). Instrument developers used: preset theory, literature searches, factor analytic methods, expert opinion or a combination of all four to determine which dimensions would be included in their tools. Unidimensional instruments were most frequent measures of ‘well-being overall’, ‘happiness’ or ‘depression’. Of these, the majority of dimensions appeared in only one of the tools identified in the review (69%, 136/196). A brief description of each dimension as defined by the authors can be found in online supplementary appendix 2; it should be noted that these definitions of dimensions may sometimes differ from dictionary definitions or current thinking. Determinants are those factors thought to influence how people think and feel, states are those specific thoughts and feelings a person can have about their lives, and consequences are specific outcomes that happen as a result of a person's either positive or negative quality of life. However, some dimensions such as general health can be understood as being a possible precursor to well-being, being central to the idea of well-being and simultaneously being influenced by how happy or satisfied a person feels about their life. Although hundreds of dimensions of well-being were identified, there was little differentiation between which were considered determinants of well-being, which were states of being well and which were consequences of a person's general health or well-being. The dimensions clustered around six key themes: ‘mental well-being’, ‘social well-being’, ‘physical well-being’, ‘spiritual well-being’, ‘personal circumstances’ and ‘activities and functioning’. A seventh set of dimensions were identified that attempted to measure ‘well-being overall’ in a global sense. Table 2 contains a brief description of each theme, and the number of dimensions linked to each. The majority of dimensions were linked to ‘mental well-being’, followed by ‘social well-being’ and ‘activities and functioning’. An organised inventory of well-being dimensions is provided in figure 3. Each dimension is linked to the specific instruments that measure it, using the reference numbers found in table 1. Colour coding is used to highlight the themes of well-being that each dimension reflects. A glossary including definitions for each of the dimensions is provided in the online supplementary appendix 2. A thematic framework of well-being. We have provided a detailed inventory of 99 generic measures of adult well-being, a timeline illustrating the development of these tools over the past 50 years and a thematically catalogued register of 196 available dimensions. The evidence suggests that there is little consistent agreement on how well-being should be measured, how instruments should be designed or which dimensions should be included. In previous reviews,30 ,31 60 or fewer instruments were identified; however, in our review 99 are reported. We believe the reasons for this are twofold. First, our initially agreed definition of well-being5 was deliberately broad, in order to reflect the multiple definitions in use. As a result, measures of happiness, for example, which touched on relevant content, were included, even though they have featured less frequently in previous reviews. Second, the current review used a wider variety of databases and hand searching. This decision was taken in order to ensure that measures used across disciplines were identified. In a topic as diverse as well-being, there is a need for both highly focused and widely scoped reviews. Narrowly focused reviews are able to provide more detailed insight on a smaller range of widely used tools, while reviews with a wider focus are able to focus on developments over time and the existence of lesser known tools, which may help researchers address their specific hypotheses. The current review identified substantial heterogeneity in how well-being was defined and used. Taken together, however, well-being should be understood as a multidimensional construct, reflecting themes that often overlap. It contains positive phenomena such as joy and social acceptance, negative phenomena such as anxiety and pain, subjective feelings and perceptions, and more ‘objective’ material circumstances or health states. Given its breadth, and the field's inability to establish an agreed definition, it may be more advantageous to use ‘well-being’ as an umbrella term reflecting the above concepts, instead of as a distinct unitary concept. Greater specificity should instead be reserved for dimensions of well-being. The value and use of the measurement instruments will vary. Short measures of global well-being, such as the Arizona Integrative Outcomes Scale (AIOS) or the WHO-5 provide quick global snapshots on well-being, while taking up very little time from participants. In comparison, broader scoped instruments such as the Biopsychosocialspiritual Inventory (BIOPSSI) or the Mental Physical Spiritual Well-Being Scale (MPS) assess well-being separately across themes, and are thus able to provide a more comprehensive assessment. Other instruments assess more specific dimensions such as financial distress/well-being or social acceptance. These instruments are conceptually narrower and, as a result, are better equipped to facilitate more focused assessment. We limited the inclusion criteria to measurement instruments that were used as generic tools for adults. Although this meant that we will have missed measures of well-being for use in condition-specific and context-specific instances, the decision was justified on pragmatic grounds in order to keep the review more focused on measures for use across populations. The extensive literature, inconsistent phrasing and disorganisation remain significant challenges for those conducting systematic reviews on the topic of well-being. It is unlikely that any search strategy could collate a definitive list of instruments; however, hopefully the broad approach taken in the current work is able to complement the selective reviews already in existence. In contrast to the psychometric focus of previous reviews, the objective of our work was to inform researchers about the dimensions available and the thematic differences among instruments. Further research should investigate the psychometric properties of this wider set of tools, with a specific focus on the issue of content and construct validity. Merging these strands of work should strengthen the methodological quality and our understanding of the subject. A long list of well-being measures has been provided, but ambiguity surrounding the measurement of well-being remains. In the current work, we have attempted to be inclusive, rather than attempting to consolidate the measurement options; however, additional research should be conducted in order to investigate whether so many measures are necessary. For example, some of the measures available may be too similar to other instruments already in use. Others developed many years ago may simply no longer be of value due to the ongoing development of newer instruments or because they are based on outdated theories. Work to clarify which instruments are necessary should ideally tie in with psychometric work referred to above. Further research should also focus on better understanding the conceptual similarities and differences between different dimensions of well-being. The quantitative difference between some concepts such as happiness and emotional well-being, or life purpose and life meaning, remain unclear. Unhelpfully, terms like functioning, welfare, wellness and satisfaction continue to be used interchangeably. Further research should seek to investigate whether the conceptual underpinnings of the measures identified are defensible. Progress will depend on researchers being more specific about definitions, selective about which measures are used and more cautious about how well-being terms are used. Ambiguity surrounding how well-being is conceptualised and measured prompted us to review the measurement options available, their development over time and the dimensions within them. A comprehensive overview of available instruments has been provided; however, we do not offer a recommendation for the use of any one specific instrument. Instead, we reiterate that the most appropriate measure of well-being will depend on the dimensions of well-being of most interest, in coordination with psychometric guidance. We hope the framework provided will encourage researchers to be more explicit about what specific themes or dimensions they hope to measure. The consistent rate at which new instruments have been developed suggests that continued growth can be expected. While significant empirical and policy-related developments have been made in the past 10 years, continued progress will depend on equal amounts of effort focused on understanding the methods and measures used to collect well-being data. The authors would like to acknowledge the input of Leala Watson for her work on the systematic searches, and Louise Crathorne for her help preparing the manuscript.
. Report by the commission on the measurement of economic performance and social progress. Paris: Commission on the Measurement of Economic Performance and Social Progress, 2010.
. Assessing the subjective wellbeing of nations. In: Glatzer W, Camfield L, Møller V, Rojas M, eds. Global handbook of quality of life. Springer, 2015:803–22.
. Commodities and capabilities. Amsterdam: Elsevier, 1985.
. Dimensions of well-being and mental health in adulthood. In: Bornstein M, Davidson L, Keyes CLM, Moore K, Rogers M, eds. Well-being: positive development throughout the life course. Mahwah, NJ: Erlbaum, 2003:477–97.
. Defining spiritual health: a review of the literature. J Health Educ 1991;22:287–90. OECD. How's life? 2013. Paris: OECD Publishing, 2013.
. A generic 15 dimensional measure of health-related quality of life (15D). J Soc Med 1989;26:85–96.
. The structure of psychological well-being. Chicago: Aldine Publishing Ciompany, 1969.
. Beck Depression Inventory. 2nd edn. San Antonio, TX: Psychological Corp, 1996.
. Pattern of human concern. New Brunswick: Rutgers University, 1965.
. Users’ guide to the general health questionnaire. Windsor: nferNelson, 1988.
. “The Goteborg quality of life instrument”—an assessment of well-being and symptoms among men born 1913 and 1923. Methods and validity. Scand J Prim Health Care Suppl 1990;1:33–8.
. InCharge financial distress/financial well-being scale: development, administration, and score interpretation. J Financ Counsel Plan 2006;17:34–50.
. A symptom questionnaire. J Clin Psychiatry 1987;48: 268–74.
. The subjective well-being of America's youth: toward a comprehensive assessment. Adolesc Fam Health 2006;4:3–11.
. Measuring health status: a new tool for clinicians and epidemiologists. Br J Gen Pract 1985;35:185–8.
. Personal growth initiative: the construct and its measure. Meas Eval Couns Dev 1998;30:183–98. International Wellbeing Group. Personal wellbeing index. 5th edn. Melbourne: Australian Centre on Quality of Life, Deakin University, 2013.
. Holistic measurement of well-being: psychometric properties of the physical, mental and social well-being scale (PMSW-21) for adults. Rocz Panstw Zakl Hig 2014;65:251–8.
. Society and the adolescent self-image. Princeton, NJ: Princeton University Press, 1965.
. Loneliness, spiritual well-being, and quality of life. In: Perlman LAPD, ed. Loneliness: a sourcebook of current theory, research and therapy. New York: Wiley, 1982:224–37.
. The Valued Living Questionnaire: defining and measuring valued action within a behavioral framework. Psychol Rec 2011;60:249–72. World Health Organization. WHO (five) Well-Being Index: World Health Organization. Regional Office for Europe, 1998.
. Unraveling the mystery of health: how people manage stress and stay well. San Francisco: Jossey-Bass, 1987. Collaborators Leala Watson; Louise Crathorne. Contributors The initial motivation for a review on the topic came from AM-L. The core sections of the review were formulated by M-JL, AM-L and PD. The search strategy was devised by AM-L and Leala Watson (LW). Screening records was undertaken by M-JL and AM-L, and any discrepancies were resolved through discussion with PD. Data from these records were extracted by M-JL and AM-L. M-JL and AM-L also undertook the qualitative thematic analysis, with PD examining the qualitative coding and naming of thematic domains for consistency. M-JL designed all figures, with comments and suggestions from AM-L and PD. Preparation of the manuscript was undertaken by M-JL, AM-L and PD, with considerable input from all authors. Funding This research was supported by a University of Exeter Medical School PhD Studentship.